Total abdominal hysterectomy (TAH) is a common surgery and an important cause of postoperative pain and discomfort. In these patients, multimodal postoperative treatment regimens with high-quality analgesia and minimal adverse effects can be achieved. Currently, intravenous patient-controlled analgesia (PCA) using non-opioids and opioid analgesics widely preferred for postoperative pain relief. PCA is a crucial postoperative analgesic regimen in patients undergoing TAH. Opioids such as morphine are often administered by PCA, but sedation, nausea, vomiting, and other significant side effects are observed as a result. Alternative approaches reduce the postoperative opioid requirement and likelihood of adverse effects. Therefore, a well-planned analgesic protocol is required to ensure early mobilization following gynecologic surgery, decreased post-anesthetic care unit (PACU) and hospitalization durations, and patients' comfort. The transversus abdominis plane (TAP) block is a peripheral nerve block of the anterior abdominal wall and has become increasingly available in recent years. It was developed to provide postoperative analgesia after low abdominal surgery. In this block, the lumbar Petit triangle is used as a marker for injection, and local anesthetic is administered into the neurovascular plane between the internal oblique and transversus muscles. Nerves within this plane pass through the anterior abdominal wall and arise from T6–L1. TAH pain has two divisions: somatic and visceral. Somatic division has two components, cutaneous and deep. Cutaneous component originates from nociceptors within the abdominal wall; it is transmitted within the anterior divisions of spinal segmental nerves, usually T10–L1, which runs laterally in the abdominal wall between the layers of transversus abdominis and internal oblique muscles. Visceral uterine nociceptive stimuli return via afferent nerve stimuli that ascend through the inferior hypogastric plexus and enter spinal cord via the T10–L1 spinal nerves. TAP block provides highly effective postoperative analgesia in the first 24–48 h. Overall, during the first 24 postoperative hours, the TAP block reduced mean IV morphine requirements. This reduction in opioid requirement resulted in fewer opioid-mediated side effects, and the incidence of postoperative nausea and vomiting was reduced by more than half in the TAP block group. The TAP block was shown to decrease opioid-induced sedation, respiratory depression, as well as decreasing non-invasive positive pressure ventilation; the technique improved patient compliance, and reduced the need for intubation and ventilation in the intensive care unit. Recent review indicate that ultrasound guidance reduces the number of attempts and the time of application, which speeds the block onset. Generally, TAP block has so far displayed a good safety profile. A large incentive for the widespread use of TAP block is the fact that other than the recently published liver damage and bowel hematoma. Anesthetists using TAP block should be aware of the possibility of visceral damage if the needle is advanced too far inadvertently. The catheter technique has the potential to result in more complications compared with single shot. Transient femoral nerve palsy is a potential complication because of the proximity of the TAP and the femoral nerve. The primary aim of this study was to evaluate the effectiveness of the ultrasound-guided transversus abdominis block in preventing postoperative pain and secondary aim was to investigate opioid consumption in patients undergoing TAH. After approval by the Ankara Numune Education and Research Hospital Clinical Research Ethics Committee (No. 015, dated 06.27.2013), 50 patients uterine fibroids and endometrial hyperplasia due to scheduled elective hysterectomy at the Dr. Abdurrahman Yurtaslan Oncology Education and Research Hospital were included in the study. Information detailing the anesthesia and TAP block protocol, PCA device, and the Visual Analog Scale (VAS) and Verbal Descriptive Scale (VDS) were provided to the enrolled patients, and informed consent was obtained. Patients who were the American Society of Anesthesiologists (ASA) I–III, aged 20–70 years, and with a body mass index (BMI) less than 35 kg/m2 were included. Patients with mental retardation, coagulation disorders, patient's disapproval, local anesthetic and opioid allergy, organomegaly (hepatomegaly or splenomegaly), morbid obesity (BMI ≥ 35), and infection of the abdominal wall and skin, or abnormality at the needle insertion site were excluded from the study. The study was performed as a single-blinded, prospective, and randomized study. The patients were selected randomly using sealed envelopes. The next patient group was selected to ensure equal distribution. Patients were allocated into either the control group (n = 25) or the TAP block group (n = 25). All patients were administered 0.01–0.1 mg/kg midazolam intravenously through a 20-gauge catheter while in the premedication room. Electrocardiography (ECG), heart rate, non-invasive arterial blood pressure, and peripheral oxygen saturation by pulse oximetry (SpO2) were monitored in the operation room. Anesthesia was induced using intravenous fentanyl (maximum 100 μg–1 μg/kg), propofol (2–3 mg/kg), and tracheal intubation was facilitated with rocuronium bromide 0.6 mg/kg. For the maintenance of the neuromuscular blockade, 0.15 mg/kg rocuronium was used in all the patients. Anesthesia was maintained with 1–2% end-tidal sevoflurane in 40% oxygen/N2O mixture. Phannelstein incision was performed in all patients. Once surgical closure was initiated, patients in both groups were administered 1.5 mg/kg diclofenac sodium (maximum 125 mg) intramuscularly and 4 mg ondansetron hydrochloride intravenously. After the final skin suture, PCA was initiated in all the patients using 1 mg/mL morphine at the following settings: infusion: none; bolus: 1 mg; and lockout time: 15 min. Routine, all of the groups, neostigmine 0.05 mg/kg with atropine 0.02 mg/kg for used neuromuscular blockade reversal. After extubation, the patients were transferred to the recovery unit for monitoring; meanwhile, a bilateral TAP block was performed in the TAP group at surgical conclusion. A high-frequency linear ultrasound probe was covered into sterile gloves. The target skin was wiped with 10% povidone iodine solution with a sterile cover in bilaterally sterile conditions. The ultrasound probe was positioned transversely at the border between the crista iliaca and the abdominal wall at the anterior axillary line. The probe was adjusted as needed to ensure quality images; once the cutaneous and subcutaneous tissues, the external oblique, internal oblique, and transverse abdominis muscles, and peritoneal membrane were identified, a 22-gauge, 80-mm needle (B. Braun stimuplex, Melsungen, Germany) was inserted along the probe line using an in-plane technique. When the internal oblique and transversus abdominis muscles were reached, the site was tested by aspiration, and 2 mL of the prepared solution was administered, along with a local anesthetic. Once the needle location and separation from the fascia by the bolused local anesthetic medication were verified, 15 mL of 0.25% bupivacaine solution was administered with aspiration performed every 5 mL and simultaneous monitoring. After the procedure, the patient was extubated and then transferred to the recovery unit. The following parameters were recorded on prepared forms at 1, 2, 4, 6, 12, 18, and 24 h postoperatively: heart rate, systolic arterial pressure, diastolic arterial pressure, mean arterial pressure, VAS, Ramsey Sedation Score, PCA request-receiving number, analgesic requirement, first analgesic request, nausea and vomiting, and side effects. The pain intensity was assessed with VAS (0: none, 10: most severe) and sedation assessed using the Ramsey Sedation Scale [Table 1]. VDS was used for the evaluation of nausea and vomiting (0: no nausea, 1: mild nausea, 2: moderate nausea, 3: severe nausea). Metoclopramide was administered to patients with a VDS score 2 and 3. Statistical analysis was performed using the IBM SPSS statistical analysis software package for Windows, Version 21.0. Continuous quantitative variables were presented as the mean ± standard deviation and median (minimum–maximum), and qualitative variables were summarized by the number and percentage. Normal distribution of numerical variables was determined using the Shapiro–Wilk test. Differences between the groups in numeric variables whether in independent groups were analyzed using t-test. Differences in categorical variables between the groups were analyzed using the Chi-square test. Numerical variables were compared between and within the groups using analysis of variance. If a significant difference was detected, then a Bonferroni test was used for pairwise comparisons. Quantitative relationships between variables were examined by the Spearman's correlation coefficient. The VAS, Ramsey Sedation Scale, and PCA differences between the groups associated with the number of analgesia requests and purchases were determined using the Mann–Whitney U test whether the difference in the groups were analyzed using the Friedman test. Significance was designated at P < 0.05. The demographic characteristics of the 50 participants were compared. There were no significant differences in the patient age, BMI, or ASA score between the groups [Table 2]. The anesthetic and surgical durations were not statistically different between the two groups. The anesthetic duration in the TAP block group was 104.6 ± 18.5 min, while the mean duration was 93.8 ± 17.8 min in the control group. Postoperative adverse reactions were observed in 2 (8%) patients in the TAP block group and 5 (20%) in the control group, and there was no statistically significant difference noted. In the TAP block group, included adverse reactions, one patient requiring medication to alleviate nausea and vomiting, and one patient with bradycardia. In the control group, two patients required medication to treat nausea and vomiting, two patients experienced hypertension, and one patient experienced hypotension. Patients who experienced hypotension, bradycardia, and hypertension were treated with the appropriate medications. In one patient with severe nausea and vomiting in the TAP block group, PCA was discontinued at 18 h; therefore, data at 24 h could not be recorded. When additional analgesic (paracetamol or lornoksikam) needs were evaluated in the groups, 11 of 25 (44%) patients in the TAP block group and 24 of 25 (96%) patients in the control group received additional analgesia (P < 0.05). The additional analgesic number was also statistically significantly different when compared (P < 0.001). However, there was no significant difference between the groups in the time that the first additional analgesic was administered [Table 3]. There was no statistically significant difference in the heart rates, systolic arterial pressure, mean arterial pressure, diastolic blood pressure, and Ramsey Sedation Scores between the two groups. Furthermore, no significant differences were found between the groups in patients reporting nausea and vomiting. The median VAS scores were significantly lower in the TAP block group at 2, 4, 6, 12, 18, 24 h postoperatively, but not at postoperative 1 h compared to the control group (P < 0.05, [Table 4]). 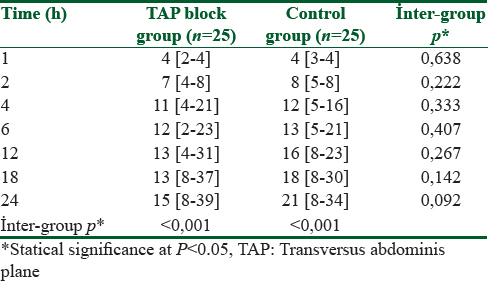 About 24–36 h of analgesia was achieved in the TAP block group. The PCA morphine consumption at each time point is shown in [Table 5]. The highest morphine dose administered in the TAP block group was 39 mg and the highest dose was 34 mg in the control group. However, this difference was not statistically significant. The number of PCA morphine requests at each time point is summarized in [Table 6]. The highest number of morphine requests was 442 in the TAP group and 397 in the control group, and a statistically significant difference between the groups was not found. The relationship between the time to first additional analgesic and the VAS was examined and in both groups at 1, 4, 6, and 12 h postoperatively, the increase in additional analgesic requirement time was correlated an increased VAS score. Despite the numerous new drugs, techniques, and studies, it may not be possible to overcome acute postoperative pain. Approximately 75% of patients undergoing surgery experience acute pain, and in 80% of patients, the pain intensity is medium and high. TAH is a common procedure that is an important cause of postoperative pain and discomfort. A multimodal postoperative regimen with high quality analgesia can be used in these patients and achieve minimal adverse effects. Opioids such as morphine are often used in PCA and are an important component of the postoperative analgesic regimen in TAH patients. However, opioid use causes significant side effects such as sedation, nausea, and vomiting. Alternative approaches reduce the likelihood of side effects and the postoperative opioid requirement. Therefore, to ensure early mobilization after gynecologic surgery, shorten the duration in the post-anesthetic care unit, shorten hospitalization, and ensure sufficient patient comfort, well-planned analgesia is required. Peripheral nerve blocks are used as part of the multimodal approach to postoperative analgesia. The TAP block, which is an abdominal field block, was first described by Rafi in 2001. Reportedly, the TAP block using ultrasound, described by Hebbart et al. in 2007, can be performed more efficiently and reliably. The benefits of the TAP block have been proven in procedures such as abdominal hysterectomy, cesarean section,, large bowel resection, open retro pubic prostatectomy, laparoscopic cholecystectomy,, and appendectomy. In our study, the need for additional analgesic, amount, and VAS values were lower in TAP block group, there was no difference in morphine consumption between the two groups. Belavy et al. compared patients administered 40 mL of either saline or 0.5% ropivacaine via a TAP block at the conclusion of a cesarean section; all patients received 1 g paracetamol and 100 mg diclofenac rectally, 400 mg ibuprofen, and morphine administered with a PCA (5 min lock, 1 mg bolus, 1 h no limit). Although there was no significant difference in postoperative VAS scores observed, there was a statistically significant reduction in postoperative morphine consumption. Carney et al. performed TAP block prior to surgical incision for hysterectomy, and they found that the TAP block with ropivacaine reduced postoperative VAS scores at 6, 36, and 48 h and total morphine requirements in the first 48 postoperative hours were also reduced. McDonnell et al. also conducted a study evaluating a multimodal analgesic regimen to patients who underwent spinal anesthesia, followed by a standard analgesic protocol (1 g oral paracetamol 4 times daily, 100 mg rectal diclofenac, and PCA prepared with morphine solution). They performed bilateral TAP block at the end of surgery, and the TAP block was shown to reduce the 48 h morphine consumption, prolong the time to the first PCA requirement, and reduce morphine consumption at 12, 24, and 36 h postoperatively. In another study of abdominal surgical cases, McDonnell et al. observed a decrease in postoperative morphine consumption and VAS scores after the TAP block at all postoperative time points, in both resting and active patients. In addition, pain scores were lower at 2, 4, and 6 h postoperatively in patients who underwent TAP block. TAP block was performed by Niraj et al. after induction of anesthesia for open appendectomy cases, multimodal postoperative analgesia in the form of PCA prepared with a morphine solution was administered; the morphine consumption was decreased in both resting and coughing VAS scores. The present study differs from those of Belavy, McDonnell, and Niraj; no difference was observed in the 1, 2, 4, 6, 12, 18, and 24 h morphine consumption postoperatively. The highest morphine consumption in the TAP block group was 39 mg and in the control group was 34 mg. But in evaluating the additional analgesic need was statistically significant between the groups. There was also a significant difference observed between the two groups in the dosages of additional analgesia. By examining ultrasound-guided TAP blocks, 50% of patients had no sensory block in L1. This situation has frequently shown that local anesthesia is not always spreading to the iliohipogastric and ilioinguinal nerves which enter TAP from the front axillary line. The Pfannenstiel incision is partially innervated from the branches of L1, and the specific blockage of these nerves reduces morphine consumption after cesarean. TAP injection to the front may block the L1 dermatome more safely and reduce post-cesarean pain. Low local anesthetic volume and lower levels of block may have caused the increase of morphine consumption. In our study, no need for infusion or loading dose of post-operative PCA and the absence of preemptive analgesia causes patients to awaken with pain. TAP block alone was not sufficient to cut-off postoperative acute pain. In the long term, it has been proven superior to the control group. Similar to findings reported by Carney and McDonnell, the VAS scores were significantly lower at postoperative 24 h in the TAP block group compared to the control group. In our study, the absent difference between VAS scores at postoperative 1 h was likely because of visceral pain resulting from hysterectomy. TAP block treat mainly somatic pain. Postoperative nausea and vomiting is one of the most common problems and is an adverse reactions of opioid analgesia. There was no significant difference in nausea and vomiting between treated and control patients in Belavy, Carney, and McDonnell's studies. Similarly, there was no difference observed in postoperative nausea and vomiting. Carney et al. found that the incidence of sedation and the postoperative sedation score decreased in the TAP block group at 1 and 24 h postoperatively. McDonnell et al. showed that the incidence of sedation was significantly lower in the TAP block group, and postoperative sedation score decreased at 6 h. In our study, there was no statistical difference in the Ramsey Sedation Scores between the groups. Other opioid side effects such as pruritus, urinary retention, and respiratory depression were not observed. However, in 23 of 25 patients who underwent TAP blocks, a sense of urgency was observed postoperatively. This symptom has not been reported in previous studies; it could not be considered urinary retention in patients with a bladder catheter inserted at the beginning of surgery. Urinary urgency is not considered a serious side effect but could be reevaluated in larger studies. McDonnell et al., in studies of patients undergoing cesarean section and large bowel resection, performed a TAP block using the Petit triangle resistance loss method without ultrasound guidance., However, Hebbart et al., stated that the block accompanied by ultrasonography (USG) is safer and more effective because correct localization of the muscles is difficult, particularly the transversus abdominis muscle, which is deeper in obese patients and thinner in elderly patients. The margin of safety was increased and block performed correctly using ultrasound guidance because all anatomical structures, the needle, and the spread of the local anesthetic was monitored directly. Analgesia can be more efficiently delivered by using an ultrasound technique with hydro dissection and maintaining the needle position below the fascia. In addition, the use of hydro dissection can be improved by changing the injection site utilized in TAP block accompanied by USG. USG may reduce vascular and visceral injuries caused by TAP block. In 2008, Farooq et al. reported accidental liver trauma following TAP in a patient with hepatomegaly and a slender build, and emphasized the importance of liver palpation before TAP block is performed. In another study, a patient reportedly developed an allergic reaction following administration of local analgesics., Other reported complications include bowel hematoma and temporary femoral nerve blockade., In the current study, there were no complications encountered in any of the 25 patients who had a TAP block. In a meta-analysis examining the effect of TAP block, it was concluded that the technique provides postoperative analgesia comparable to that of opioids, and it reduces the opioid consumption, prolongs the time until the first analgesic requirement, delivers a superior analgesic effect, and produces fewer side effects. Notably, in the present study, there was no statistically significant difference in the incidence of side effects. Preemptive analgesia is defined as the administration of medications before inducing surgical trauma. Thus, it is reported that the central sensitization and postoperative hyperalgesia are inhibited by reducing the physiologic response to nociceptive transmission., Multimodal analgesia generates an additive and synergistic effect between multiple drugs acting on different mechanisms; combination of opioid and non-opioid analgesics to improve pain control and minimize opioid-related side effects. These include the use of non-steroidal anti-inflammatory drugs, local anesthetics, peripheral nerve blocks, gabapentinoids, and alpha-2 adrenergic agonists. Any combination of these therapies can help reduce the surgical stress response and improve patient outcomes such as pain control, patient satisfaction, time to discharge, and return to daily activities as a result, doses are lowered in each group of drugs, and the incidence of adverse reactions is decreased, providing a more successful analgesia. In the present study, the infusion or loading dose of PCA preoperatively and the absence of preemptive analgesia resulted in patients waking in pain, and the TAP block alone was not sufficient to relieve postoperative acute pain. Long term, however, TAP block provided superior analgesia compared to that in the control group. The primary aim of this study was to evaluate the effectiveness of the ultrasound-guided transversus abdominis block in preventing postoperative pain and secondary aim was to investigate opioid consumption in patients undergoing TAH. In our study, we found that tap block application with USG effected postoperative pain to similar other studies. However, we observed that the TAP block was not effective morphine consumption. Postoperative pain is different from many other acute pain because of the fact that the cause is already known and is expected to occur. Due to this feature preemptive treatment approaches can be included in treatment plans. It is not possible to say that postoperative pain can be treated adequately even if the cause is clear. Intravenous PCA and non-opioid and opioid analgesics are commonly used in postoperative pain management. Alternative approaches reduce the need for postoperative opioids and side effects. After the gynecologic surgery, a well-planned analgesia plan is needed to provide early mobilization, shorten post-anesthetic care unit, hospital stay, and to ensure adequate patient comfort. Increasing patient satisfaction, reducing hospital stay can lead to significant savings in hospital costs. Therefore, TAP block application may be a good alternative for cutting postoperative pain. Our study is a single-blind randomized study design, and the absence of postoperative PCA infusion or loading dose and preemptive analgesia is the limiting feature of our study. Different infusion doses and TAP block applications can be applied in hysterectomy. Further studies can be done on this subject. Based on these observations, it can be concluded that the ultrasound-guided TAP block in patients undergoing a TAH may be a safe and effective method to relieve postoperative pain as a part of multimodal analgesia. Apfelbaum JL, Chen C, Mehta SS, Gan TJ. Postoperative pain experience: Results from a national survey suggest postoperative pain continues to be undermanaged. Anesth Analg2003;97:534-40. Huang N, Cunningham F, Laurito CE, Chen C. Can we do better with postoperative pain management? Am J Surg2001;182:440-8. Dolin SJ, Cashman JN, Bland JM. Effectiveness of acute postoperative pain management: I. Evidence from published data. Br J Anaesth2002;89:409-23. Carney J, McDonnell JG, Ochana A, Bhinder R, Laffey JG. The transversus abdominis plane block provides effective postoperative analgesia in patients undergoing total abdominal hysterectomy. Anesth Analg2008;107:2056-60. Kemal SÖ, Şahin Ş, Apan A. Postoperatif aǧrı tedavisinde intravenöz hasta kontrollü analjezi yöntemi ile kullanılan tramadol, tramadol metamizol. Aǧrı 2007;4:24-31. Sivapurapu V, Vasudevan A, Gupta S, Badhe AS. 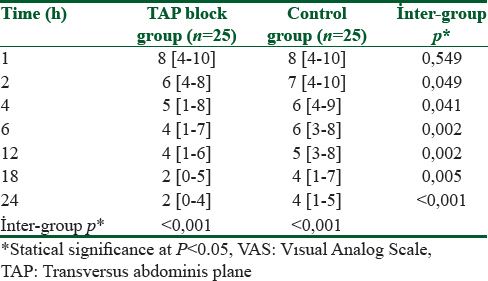 Comparison of analgesic efficacy of transversus abdominis plane block with direct infiltration of local anesthetic into surgical incision in lower abdominal gynecological surgeries. J Anesthesiol Clin Pharmacol 2013;29:71-5. Petersen PL, Mathiesen O, Torup H, Dahl JB. The transversus abdominis plane block: A valuable option for postoperative analgesia? A topical review. Acta Anaesthesiol Scand 2010;54:529-35. Singh M, Chin KJ, Chan V. Ultrasound-guided transversus abdominis plane (TAP) block: A useful adjunct in the management of postoperativerespiratory failure. J Clin Anesth 2011;23:303-6. Ceyhan D, Güleç MS. Postoperatif aǧrı sadece nosiseptif aǧrı mıdır? Aǧrı 2010;22:47-52. Hebbard P, Fujiwara Y, Shibata Y, Royse C. Ultrasound-guided transversus abdominis plane (TAP) block. Anaesth Intensive Care2007;35:616-7. McDonnell JG, Curley G, Carney J, Benton A, Costello J, Maharaj CH, et al. The analgesic efficacy of transversus abdominis plane block after caesarean delivery: A randomized controlled trial. Anesth Analg2008;106:186-91. McMorrow RC, Mhuircheartaigh RJ, Ahmed KA, Aslani A, Ng SC, Conrick-Martin I, et al. Comparison of transversus abdominis plane block vs spinal morphine for pain relief after Caesarean section. Br J Anaestth2011;106:706-12. McDonnell JG, O'Donnell BD, Curley G, Hefferman A, Power C, Laffey JG. 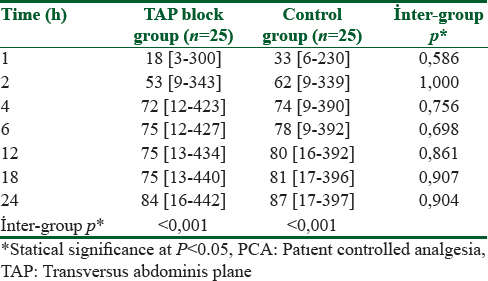 Analgesic efficacy of transversus abdominis plane (TAP) block after abdominal surgery: A prospective randomized controlled trial. Anesth Analg2007;104:193-7. O'Donnell BD, McDonnell JG, McShane AG. The transversus abdominis plane (TAP) block in open retropubic prostatectomy. Reg Anesth Pain Med2006;3:91. El-Dawlatly AA, Turkistani A, Kettner SC, Machata AM, Delvi MB, Thallaj A, et al. Ultrasound-guided transversus abdominis plane block: Description of a new technique and comparison with conventional systemic analgesia during laparoscopic cholecystectomy. Br J Anaesth2009;102:763-7. Ra YS, Kim CH, Lee GY, Han JI. The analgesic effect of the ultrasound-guided transverse abdominis plane block after laparoscopic cholecystectomy. Korean J Anesth 2010;58:362-8. Niraj G, Searle A, Mathews M, Misra V, Baban M, Kiani S, et al. Analgesic efficacy of ultrasound-guided transversus abdominis plane block in patients undergoing open appendicectomy. Br J Anaest2009;103:601-5. Belavy D, Cowlishaw PJ, Howe M, Phillips F. Ultrasound-guided transversus abdominis plane block for analgesia after Caesarean delivery. Br J Anaesth2009;103:726-30. Watcha FM, White PF. Postoperative nausea and vomiting. Its etiology, treatment and prevention. Anestesiology1992;77:162-84. Farooq M, Carey M. A case of liver trauma with a blunt regional anesthesia needle while performing transversus abdominis plane block. Reg Anesth Pain Med2008;33:274-5. Rosario DJ, Jacob S, Luntley J, Skinner PP, Raftery AT. Mechanism of femoral nevre palsy complicating percutaneous ilioinguinal field block. Br J Anaesth1997;78:314-6. Frigon C, Mai R, Valois-Gomez T, Desparmet J. Bowel hematoma following an iliohypogastric-ilioinguinal nerve block. Paediatr Anaesth2006;16:993-6. Siddiqui MRS, Sajid MS, David R, Uncles MB, Cheek L, Baig MK. A meta-analysis on the clinical effectiveness of transversus abdominis plane block. J Clin Anesth 2011;23:7-14. Kehlet H, Dahl JB. The value of “multimodal” or “balanced analgesia” in postoperative pain treatment. Anesth Analg1993;77:1048-56.